1. Part one: Controlled exercises. 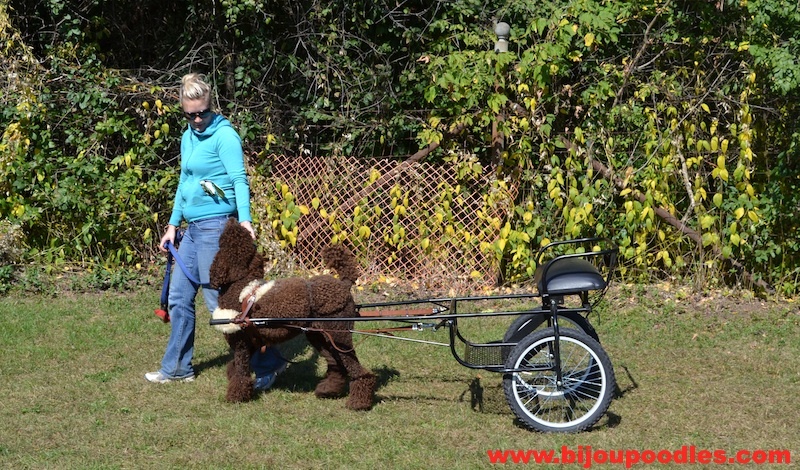 to demonstrate dog's usefulness as a draft animal in maneuvering safely hitched to a cart or wagon as well as team willingness and ability to work together off lead.Â You need to harness and hitch your dog, 3 judges will come one by one. Each will inspect the harness and the safety of the equipment for the dog. 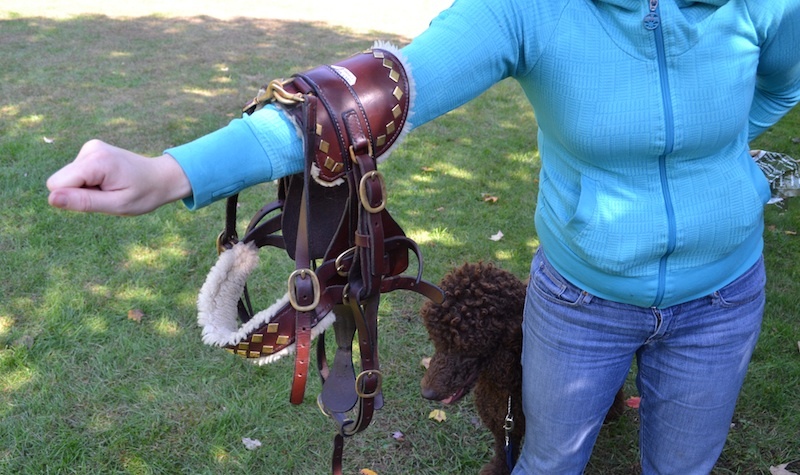 The handler's skill and dog's willingness to work, to stand harnesses and hitched for examination is judged. The serious of maneuvers must be performed in the ring on judge's command: at least twice: forward, halt, left turn, right turn, at least one Slow not less than 4 feet followed by normal pace. If the dog or a vehicle touch any solid object higher than 6â€ in the ring or during freight haul you fail. Next, the team performs figure 8 exercise with pylons 6' to 8' feet apart for a cart, 8' to 12' for a wagon. Back up 4 feet harnessed and hitched. 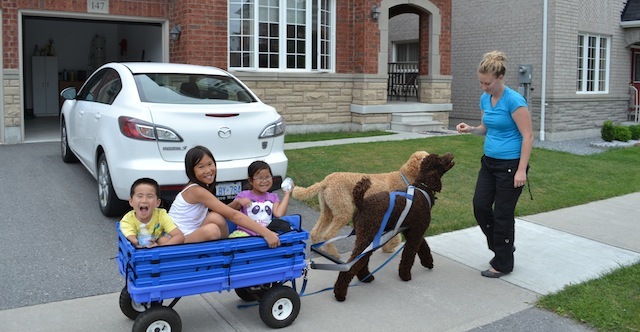 Both dog and vehicle must move backward. Part 3. 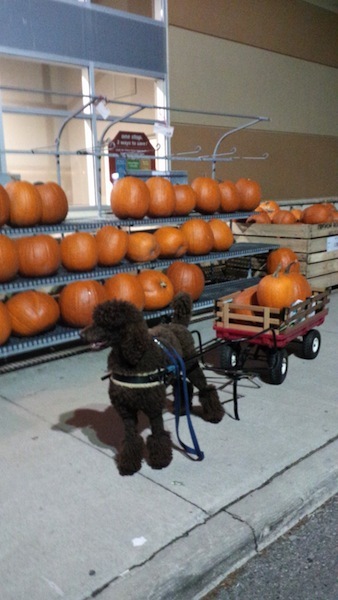 Field work exercise: demonstrates dog's ability to pull a suitable freight load over a moderate distance through cross terrain in cooperation with his handler. Terrain is usually with moderate slops, boulders, high grass and trees, ditches etc. providing natural obstacles. The load is 40 lbs and can be any number of objects from flower pots to skate, rocks, logs, umbrellas. 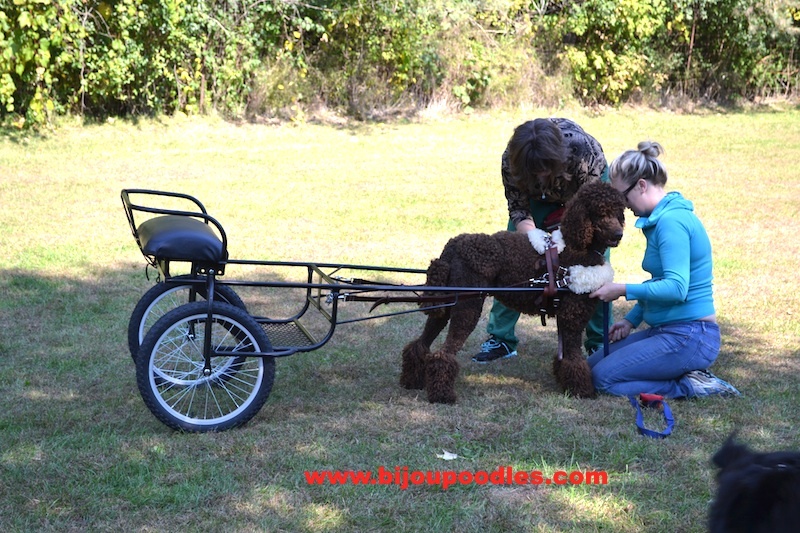 The team walks half the distance of the coarse, comes to a designated loading area, where the handler commands a dog to stand and weigh, loads up the cart, secures the load and they proceed through the rest of the coarse after all 3 judges inspected how secure and safe the load is for the dog. All of lead and no touching. Only verbal commands are allowed. 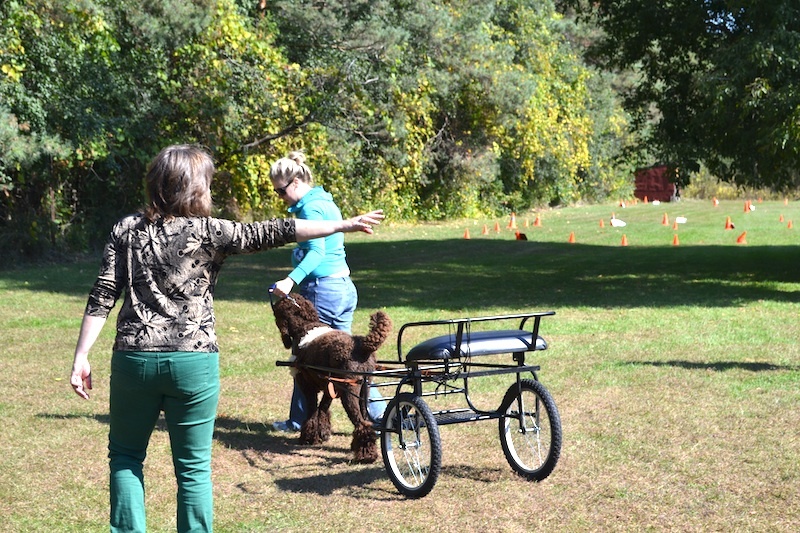 At the end of the coarse, the handler commands the dog to stand, un-loads, un-hitches and the test is over. 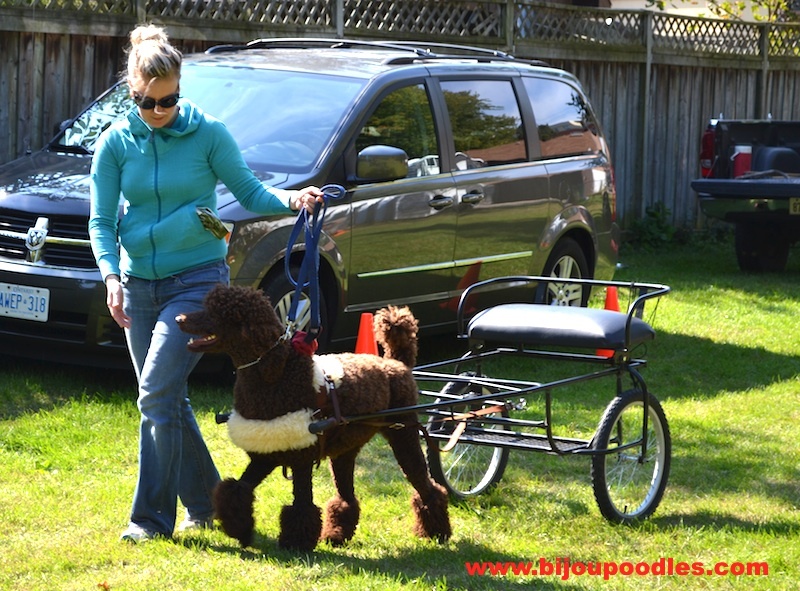 If during any part of the test your dog sits, relieves itself, dog or any part of its cart or wagon touches any solid object, if any piece of the load falls off the cart/wagon, or your team fails to perform any exercise- you NQ. If you get 3 qualifying scores from all 3 judges, you pass and get DD title, if not, well, get back to training and try again.